Forgotten Mines is a uniquely creative, quality-driven team of visionaries that efficiently collaborate to build the world’s most enjoyable experiences. Our innovation knows no bounds and we empower to build whatever delights our users. Each of us is a master of his/her craft and defines industry excellence. Our agility allows us to weather the most challenging situations and our unity keeps us focused on building software of the highest quality. We dream big, and we have fun making our dreams come true. 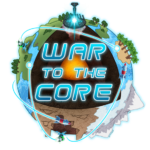 As a game development studio, our flagship product is War to the Core, a futuristic themed MOBA, in which actions take place on Earth, ridden by wars. Different factions ally up for access to harvest energy out of our planet, to have enough of it to be able to leave Earth in search of new lands to settle on. Drained by our greed for power and global dominance, there isn’t much left and only a single alliance will be able to get a chance to survive. You should head over to the website for the game if you’re interested in specific details about it.